1996 850 12VDC port inoperative , standard? Well the lighter is totally standard, I've used a few accessories there with no issue, including various USB chargers, so that's not why. Maybe there is some corrosion or debris in the socket? Try cleaning it out. Or you could pull the socket from a junkyard car and swap it in. I've probably got a spare if you can't find one. Thanks. I tried digging around with a cleaning wipe with my finger with no joy, but will try some contact cleaner tomorrow. Good idea. Use a good flashlight and take a look into the socket, might help to sort it out. 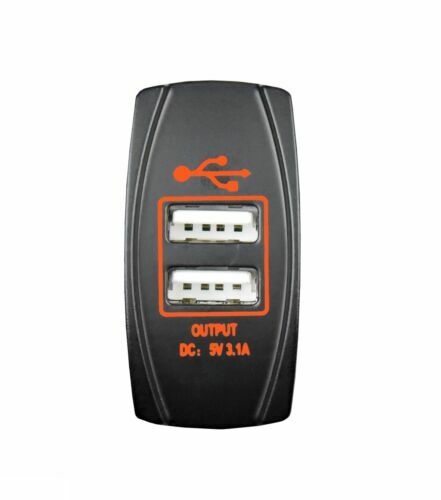 Cigarette Lighter sockets and 12V Accessory socket are built to different standards. Look close and your find the differences. Got any blank switch positions on the dash? There are USB chargers that fit in holes designed for rocker switches. Lots of options from 2001 on, but NLA prior to that, or I couldn't find it. Re: 1996 850 12VDC port inoperative , standard? The one shown is an aftermarket. You can find them on eBay. Search for "USB Rocker Switch". Pick your style and color. Some versions come with a built in Volt Meter, which some may find handy. While this factoid is undoubtedly true Rick, it is also very general - do you really think it is relevant to OP's actual problem? As stated I've never had any problems with USB chargers in any P80 car, and have never heard of them on the fora. This is a very generic, 20 year old lighter socket. A functioning, stock unit can easily be made to work for OP's intent. I’ve had trouble with some USB plugs not making good contact with the Volvo plug, both dirt induced and also not latching in. I’ve only got one switch position left open on the T5, though.